Divers swimming by the remote island of Kokoya, Indonesia came across something heartbreaking: two rare dugongs trapped in cages and on chains. According to The Sun, these marine mammals seemed to be mother and calf. The divers said that they were told the two had been caught by local fishermen hoping to profit from their suffering. One of the divers, Delon Lim told The Dodo that while the younger creature was able to swim a bit inside its cage the mother's movement was restricted by a huge rope. 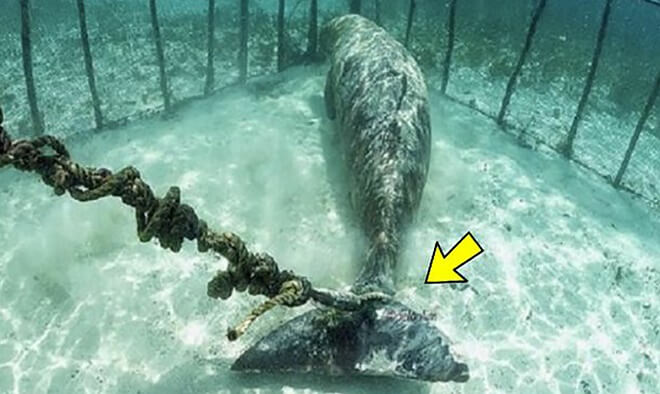 The scars on the mother's tail as well as the wear on the rope suggested that the two had been chained for several weeks by the fishermen. Before leaving the island the two divers made efforts to convince the fisherman to release the animals and while the fisherman claimed he would they did not believe him. The two divers took to social media in order to get something done about this and were successful. The photos and video posted online were enough to get local animal welfare authorities out and about doing what needed to be done. The very next day these two amazing creatures were released.